Summer is just about here and like most moms, I am both excited about it and dreading it at the same time. Schedules that are filled with pool parties and family vacations are much more enjoyable than the chaos of school projects and lost permission slips. However, summer vacation also means bickering kids and a work at home mom who doesn’t get much accomplished! The one thing I love about summer is getting together with friends for BBQs, picnics, and dinner at the pool. Getting together with friends and family to share food is a great way to reconnect and relax every once in a while. One of my favorite dishes to bring to an outdoor gathering is a simple pasta salad recipe. Easy to put together and it will feed a crowd, this Chicken Taco Ranch Pasta Salad Recipe is one you should add to your summer to do list! I would love to know what your own favorite pasta salad recipe is…there are a whole lot of weekend get togethers to cook for this summer! This Chicken Taco Ranch Pasta Salad Recipe is simple and quick. It will feed a crowd on a budget! Cook pasta according to package directions and drain. Rinse and let cool slightly. Pour into a large container and sprinkle with remaining green onions/chives. Chill or serve at room temperature as desired. 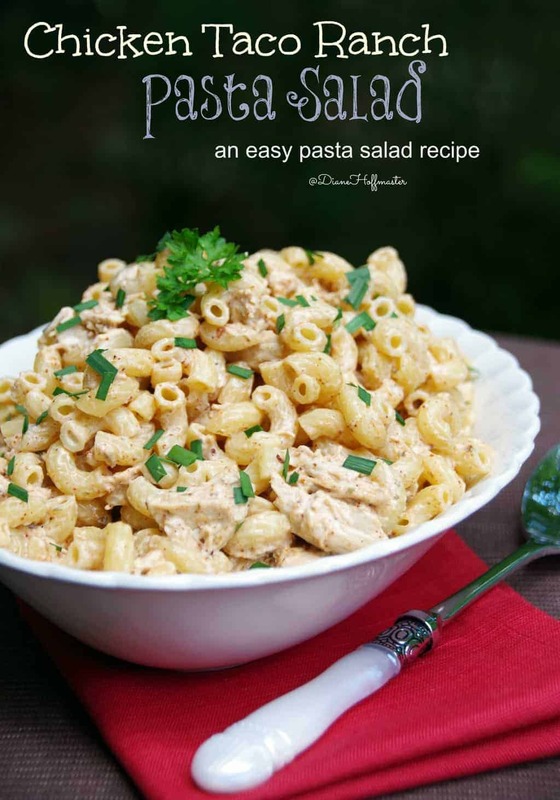 If you like the combination of flavors in this pasta salad recipe, you should check out the Chicken Taco Ranch appetizers I made last month. 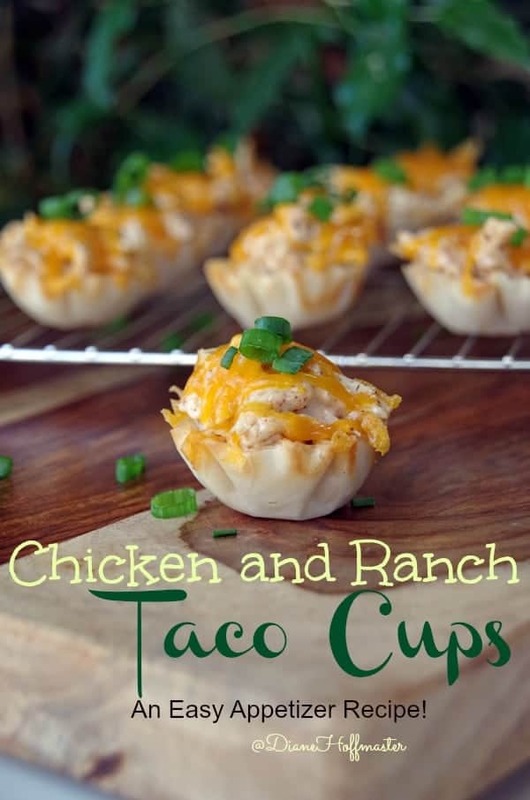 Leaving out the pasta and adding the creamy taco ranch chicken to small pastry cups gives you a delicious appetizer for your next party! If you like the recipes I share, consider checking following me on Pinterest. Just click the widget below to check out my personal recipes! Follow Diane Hoffmaster’s board My recipes on Pinterest.